We received $13,593 from 74 Influencers for Chabad Flamingo! We’re looking for 101 Influencers to Collaborate with Us. Together WE CAN Ring 2019 in with a Bang! Working in concert as one – we've had one incredible year filled with remarkably successful programs, one after the other. Collectively we've made extraordinary impressions, achieving unprecedented influence across our community and beyond. We want to achieve even more in 2019 – and Yes! You Can Choose to “Collab with Us” to make that happen! Chabad Flamingo serves the Thornhill Jewish community and beyond with a continuous stream of dynamic spiritual, educational and social activities. Each year, thousands from all walks of life are nourished, informed, united and inspired with cherished, traditional Torah values. Regardless of background, vocation or affiliation all are warmly welcomed. Chabad Flamingo’s footprint extends far beyond the local community, with hundreds of thousands across the world watching, listening and learning from Rabbi Mendel Kaplan on the internet, radio and television. 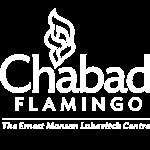 Chabad Flamingo is a non-profit corporation. All donations are tax deductible. I would like to receive news and updates from Chabad Flamingo by email.